For this I needed a few ‘naked’ skeletons armed with hand weapons and shields plus some others wearing simple armour and helmets. The old Citadel Skeleton Horde box set would have been perfect but sadly it’s long OOP and any you see nowadays are pricey. For once I think the high prices the unassembled sprues of these go for on eBay are justified. The closest modern product to the Horde box appears to be the Wargames Factory Box of 30 Skeletons. Having read mixed reviews about them (Main Pro – great anatomical detail. Main Con – overly fragile) I decided to give them a miss*. So what to do? I’m still suffering from Manticophobia (I’ve just said it so yes, that’s a thing now) and there’s no metal ranges in production in my price range that I like. My cheap and cheerful go-to, Reaper Bones miniatures, has Skeletons but they don’t look the greatest – way too bendy looking. My options seemed fairly limited. Vampire Counts Skeletons. I thought these would be a bit crap but I was wrong. Yes there’s stupid horned helmets, skulls on some of the shields, a standard with skulls, etc etc but if you’re astute about the assembly you can make some really usable generic fantasy skeletons. I prefer my skeletons to be a bit grubby looking and straight out of the grave rather than bleached clean anatomical teaching aids from stereotypical Professor’s Studies. I think these show that, and of course it meant a quick drybrush job on the bones saved a bit of time. I used Army Painter skeleton bone spray primer to undercoat them. It worked a treat and gave a rich instant colour that washes could be directly applied to. I accidentally went a bit heavy with my final pass with the spray though so some of the detail was a little obscured by too heavy a coating. Ho hum, I’ll be more gentle with the rattle can next time! A quick count will also reveal I’m one skeleton missing from the box of ten. When you fail to realise one has accidentally fallen from your paint table and you then step on it, you’ll be amazed at the fantastic crunch sound a GW Skeleton can make…. * I’ve since learnt from Scent of a Gamer’s Review of Wargames Factory Skeletons they’re actually more robust and not as fiddly to assemble as some people suggest. I’ll give them a go next time I need more skeletons. This entry was posted in Post-1990 and tagged Frostgrave, Games Workshop, Skeleton, Vampire Counts on October 25, 2015 by Hobgoblin Orange. With my usual sense of thrift the next miniature off the Random Encounters list is this Reaper Bones Ogre Chieftain, who has been promoted to Frost Giant. Traditionally Frost Giants always seem to be giant Vikings painted up with blue or grey skin. I’ve never been fond of blue skinned humanoids in fantasy games – the way people painted bright blue AD&D Drow in the 80s and 90s put me off for life. In my opinion the only blue skinned humanoids should be demons or Aliens. Or Smurfs. I don’t object to grey skin tones in the same way as I do with blue and I plan to use grey for the trolls. With that in mind I went for a ‘real’ skin tone with the giant. The moulding detail on this is the best I’ve experienced with a Reaper Bones miniature. As a sculpt it’s got just about every texture except feathers and chainmail – skin, metal, fur, wood, hair, cloth etc and all of them were crisp enough without any areas of flat detail that often occurs with smaller Bones miniatures. Clearly the material lends itself better to larger sculpts. This entry was posted in Post-1990 and tagged Frost Giant, Frostgrave, Ogre Chieftain, Reaper Bones on October 18, 2015 by Hobgoblin Orange. I’ve always liked the idea of Wraiths in games so I was looking forward to painting one up, if only I could find one I actually liked. 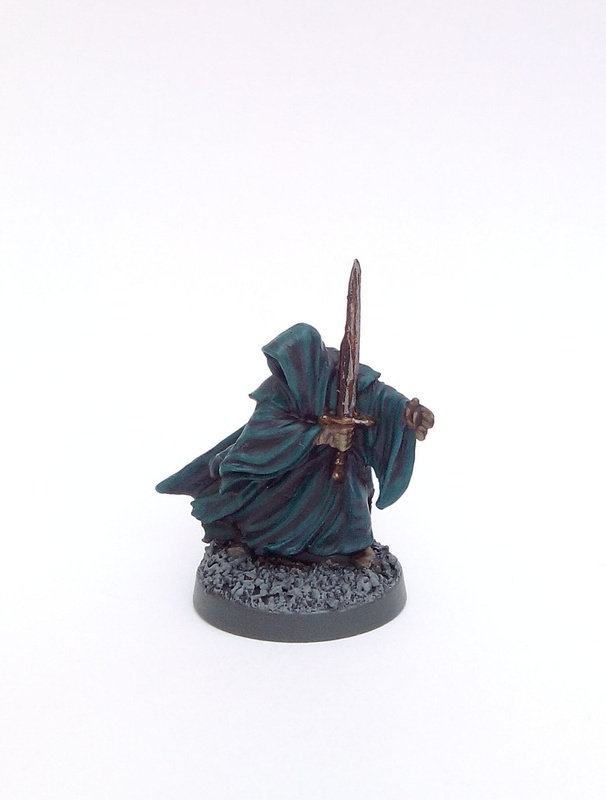 In a perfect world I’d have preferred to have used the old Citadel ME64 Ring Wraith as it’s probably my all time favourite cloaked ethereal/undead miniature, however I’m not prepared to pay the prices that these go for on eBay nowadays so I needed to find an alternative. The later GW range of metal undead figures (circa 1993 onwards) are pretty awful in my opinion so I didn’t want to use any of those. A lot of people use Mantic’s undead figures nowadays and from most reports they seem to be okay on the whole, particularly in comparison to other ranges produced by Mantic (yes, I’m looking at you Basilean infantrymen) – The problem is I don’t actually like the Wraiths they produce, they’re very reminiscent of the early 90s GW figures. The best looking alternative I could find was one of the GW Lord of the Rings/The Hobbit Ring Wraiths which I picked up for about £3 including postage off eBay. I didn’t want the cloak to be a straight black/grey paint job so opted for dark green. For some reason the photo makes the paint job look darker and duller than it actually is, the green is much richer in natural light. Never mind, it’s one more miniature off the list! This entry was posted in Post-1990 and tagged Frostgrave, Games Workshop, LotR, Wraith on October 11, 2015 by Hobgoblin Orange. Whilst assembling the soldiers from the last few posts I’ve also managed to kit bash an extra wizard using components from the leftovers of my GW Bretonnian, Empire Flagellant and Chaos Marauder sprues. Simple but effective enough, I think he has a suitably ‘wizardy’ feel about him. 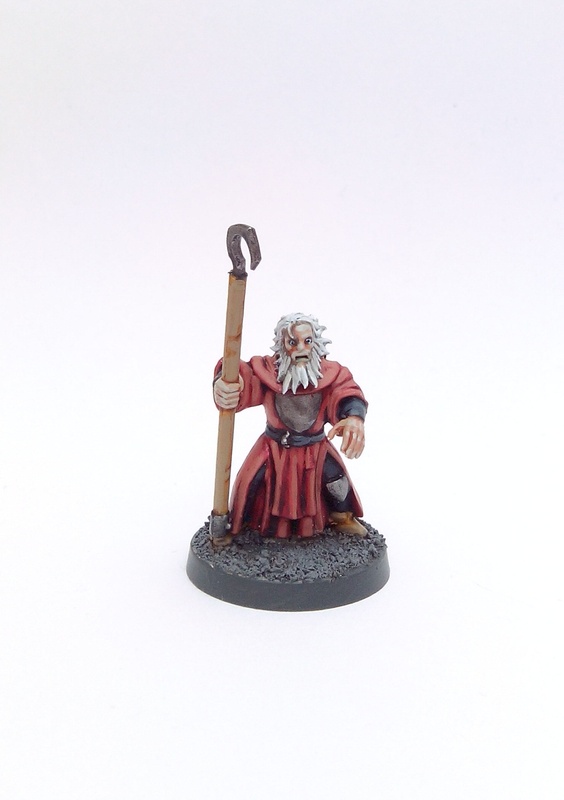 This entry was posted in Post-1990 and tagged Frostgrave, Games Workshop, kit bash on October 4, 2015 by Hobgoblin Orange.